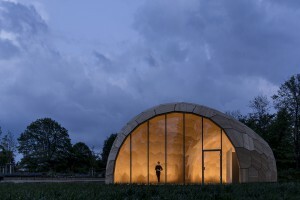 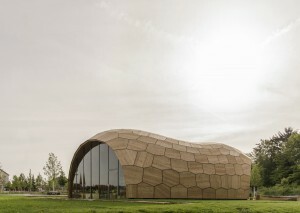 The Landesgartenschau Exhibition Hall is an architectural prototype building and a showcase for the current developments in computational design and robotic fabrication for lightweight timber construction. 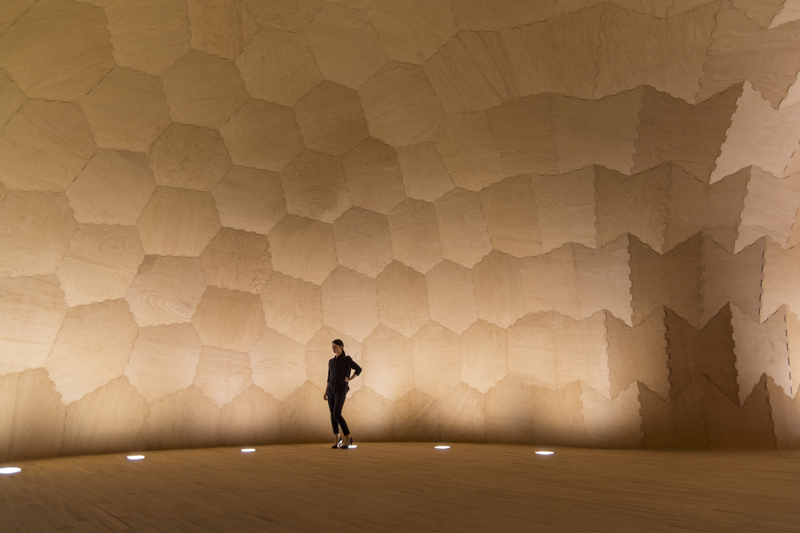 Funded by the European Union and the state of Baden-Württemberg, the building is the first to have its primary structure entirely made of robotically prefabricated beech plywood plates. 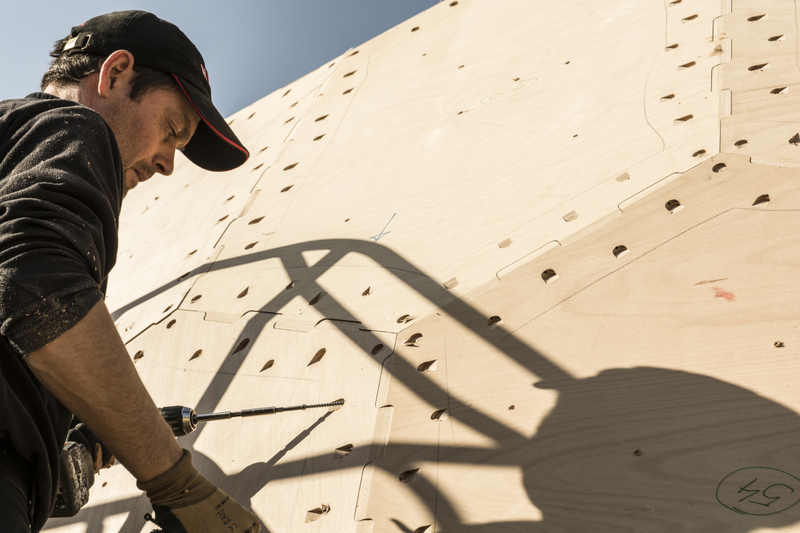 The newly developed timber construction offers not only innovative architectural possibilities; it is also highly resource efficient, with the load bearing plate structure being just 50mm thin. 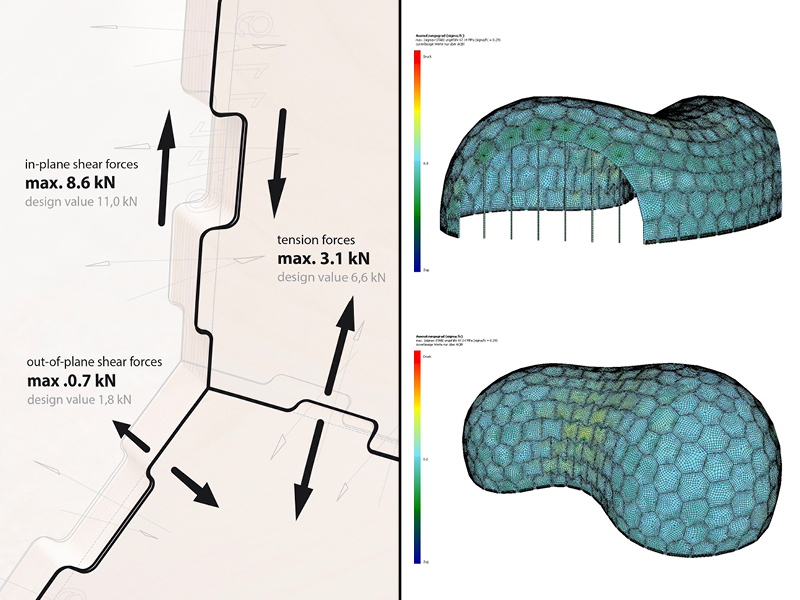 This is made possible through integrative computational design, simulation, fabrication and surveying methods. The Landesgartenschau Exhibition Hall was conceived at the University of Stuttgart as part of the “Robotics in Timber Construction” research project and realized in collaboration with Müllerblaustein Holzbau GmbH, Landesgartenschau Schwäbisch Gmünd 2014 GmbH, the forest administration of Baden-Württemberg (ForstBW) and KUKA Robotics GmbH. 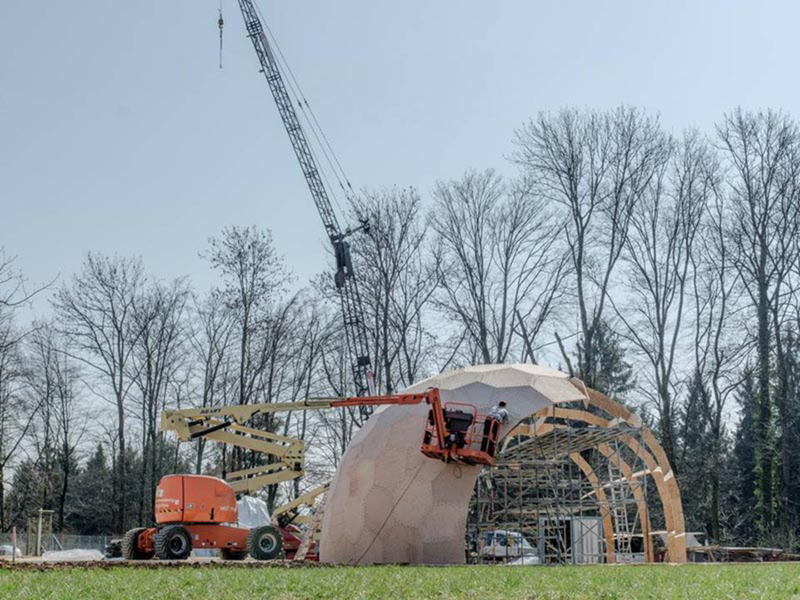 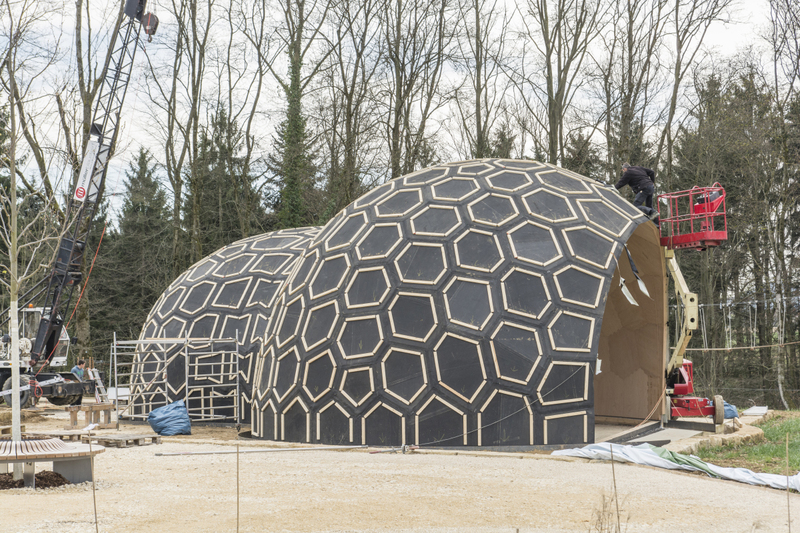 The project demonstrates the new opportunities that arise from the integration of computational design, simulation and fabrication methods for performative and resource efficient constructions made from the locally available and renewable resource wood. 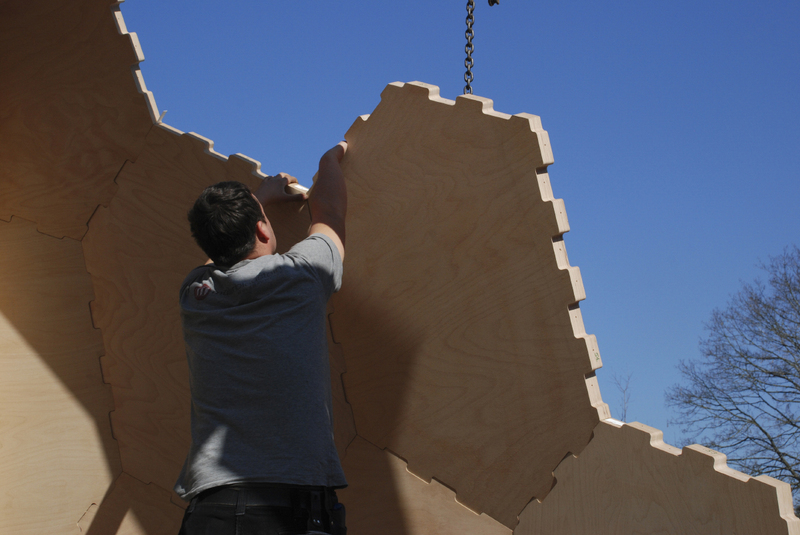 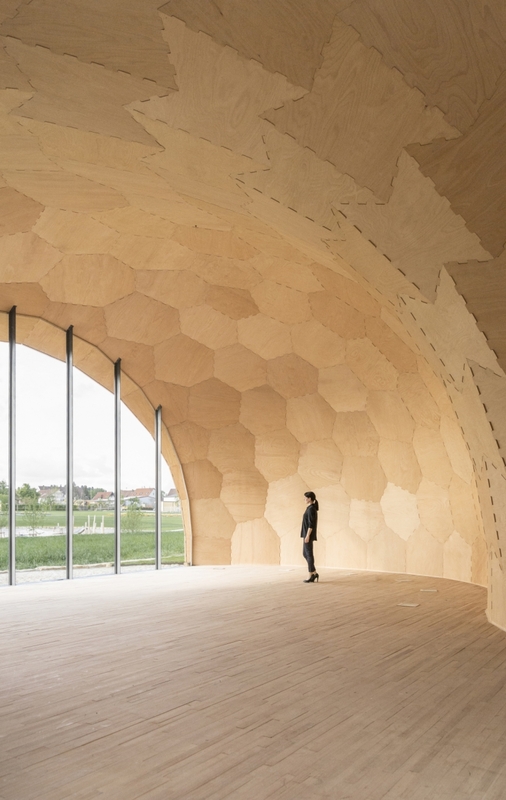 The building introduces an innovative, robotically fabricated lightweight timber plate construction system made of beech plywood. 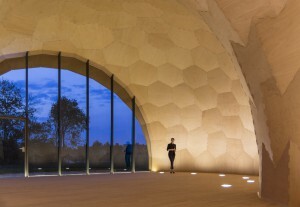 It was developed at the Institute for Computational Design (ICD, Prof. Achim Menges), the Institute of Building Structures and Structural Design (ITKE, Prof. Jan Knippers), and the Institute of Engineering Geodesy (IIGS, Prof. Volker Schwieger) and realized in collaboration with Müllerblaustein Holzbau GmbH. 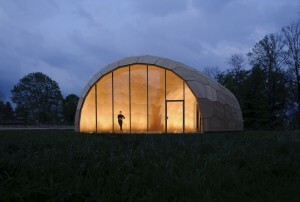 The building is part of the biannual Landesgartenschau, where it hosts an exhibition by ForstBW. 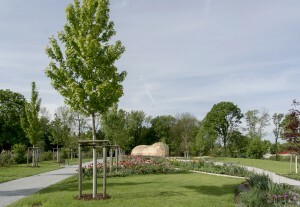 The project was partly funded by the European Fund for Regional Development (ERDF) and “Forst und Holz” Baden-Württemberg as well as by the project partners. 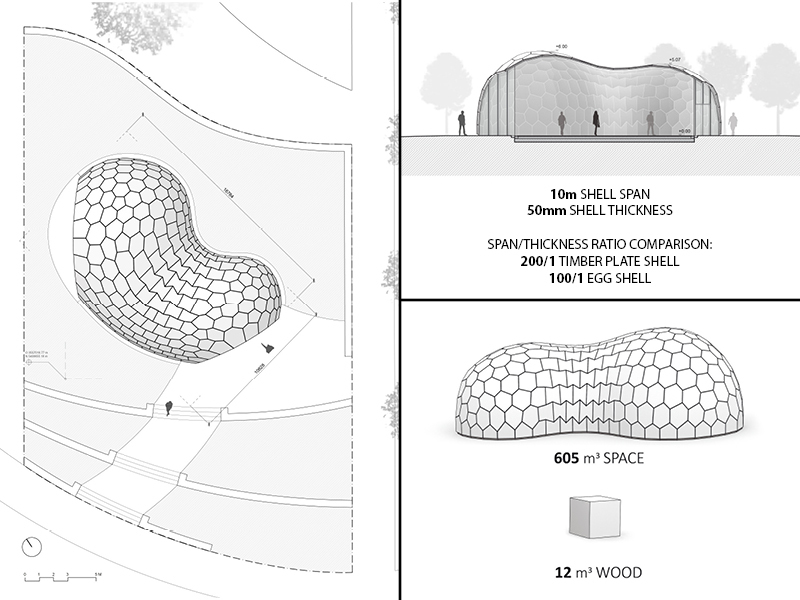 In comparison to man-made constructions natural biological constructions exhibit a significantly higher degree of morphological differentiation. This differentiation in form and structure is a key aspect for their performance and resource efficiency, achieving “less material” through “more from”. 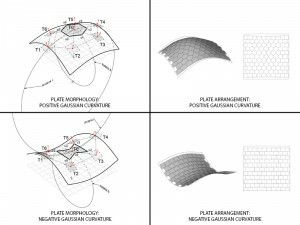 For this reason, principles of constructional morphology can often be transferred into the design of technical applications including architecture and construction. 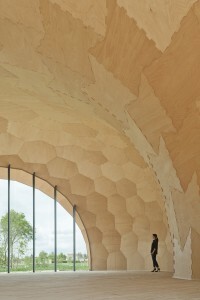 In the context of the Landesgartenschau Exhibition Hall, natural plate shells are of particular interest as they are a performative construction system made of individual elements. 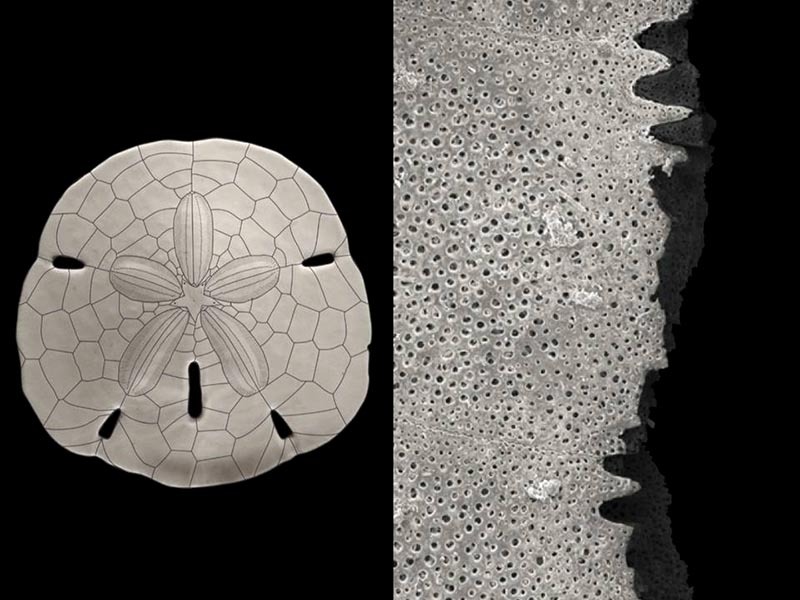 The skeleton of sea urchins is such a modular system made of calcium carbonate plates that are joined by microscopic interlocking projections along the plate edges that are very similar to man-made finger joints. 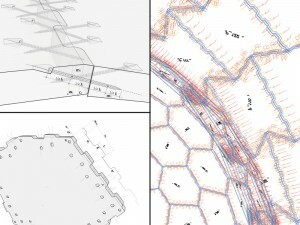 The development of the Exhibition Hall’s complex plate structure is made possible through advanced computational design and simulation methods. 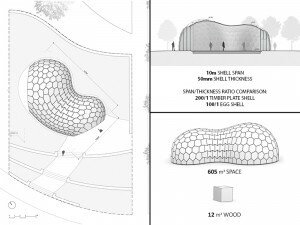 These allow the generation, simulation and optimisation of biomimetic construction principles in architecture. 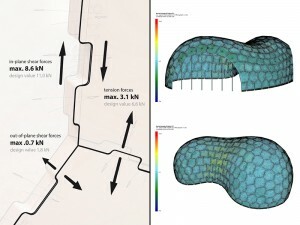 The computational design tool developed in the context of this research project offers the possibility to include material characteristics and fabrication parameters in the design process. 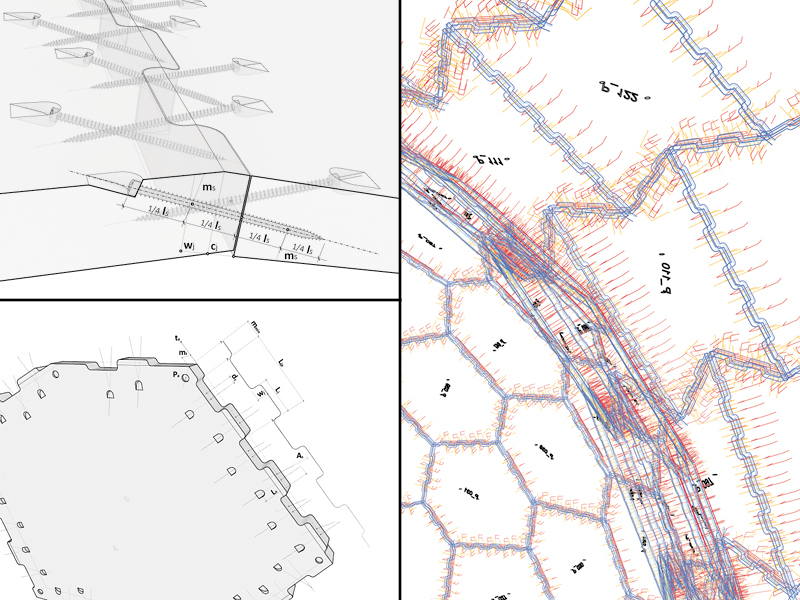 Rather than drawing each plate manually, the plate’s design space is incorporated into a simulation and optimisation process for automated form-finding, which includes parameters and constraints of robotic fabrication. 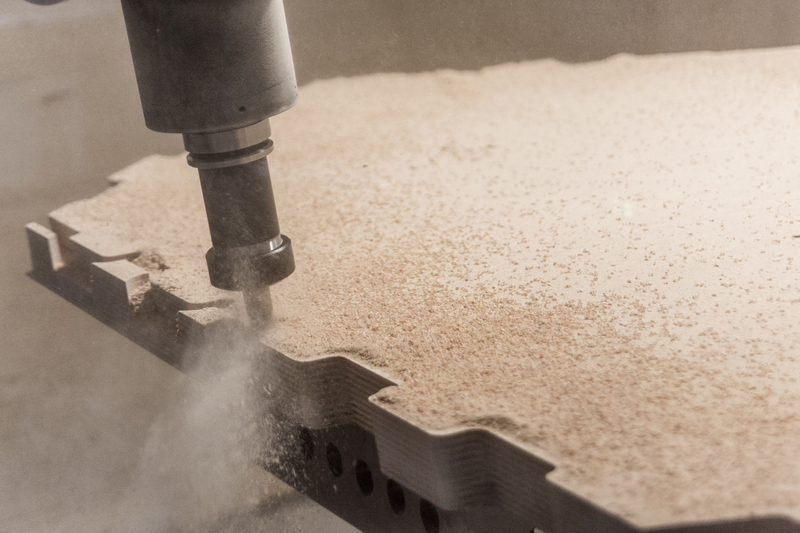 A main focus lies on the coherent digital chain from the geometry generation to the structural analysis and digital fabrication. 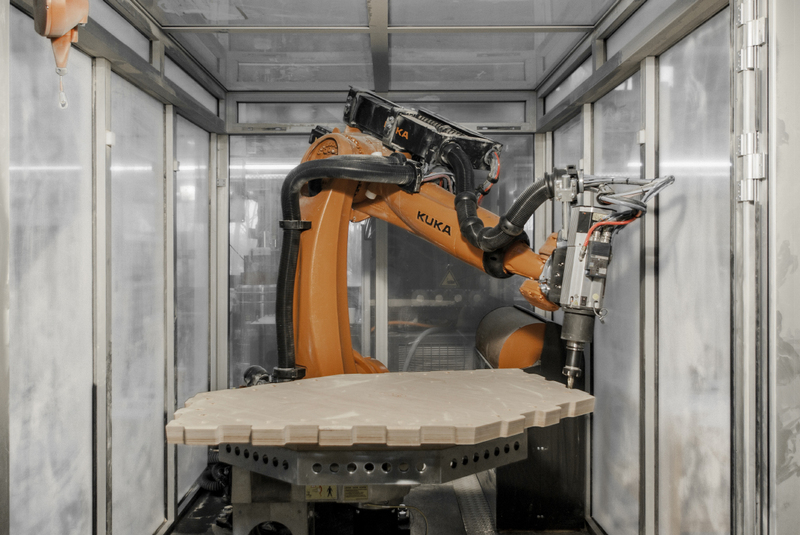 This includes the robotic fabrication of all 243 geometrically differentiated beech plywood plates for the primary structure, as well as the digital prefabrication of the insulation, waterproofing and cladding. 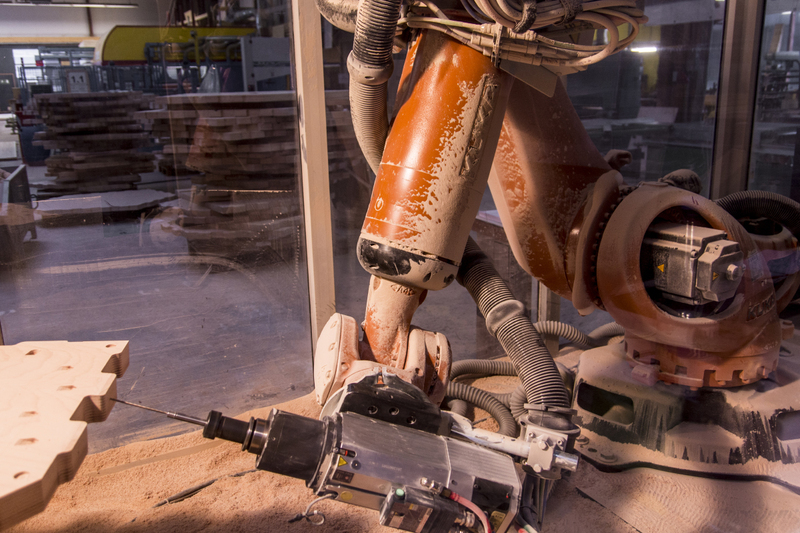 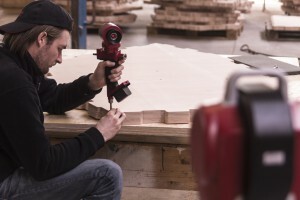 One of the most important challenges and innovations is the robotic fabrication of the 7600 individual finger joints, which, through their interlocking connection, are the main reason for the building’s structural stability. 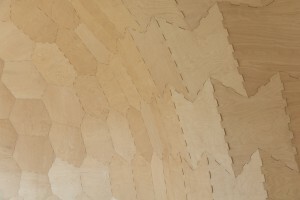 Still visible in the building’s interior, the finger joint connections resemble the sand dollar’s microscopic connections and are only efficiently producible with a seven axis robotic fabrication setup. 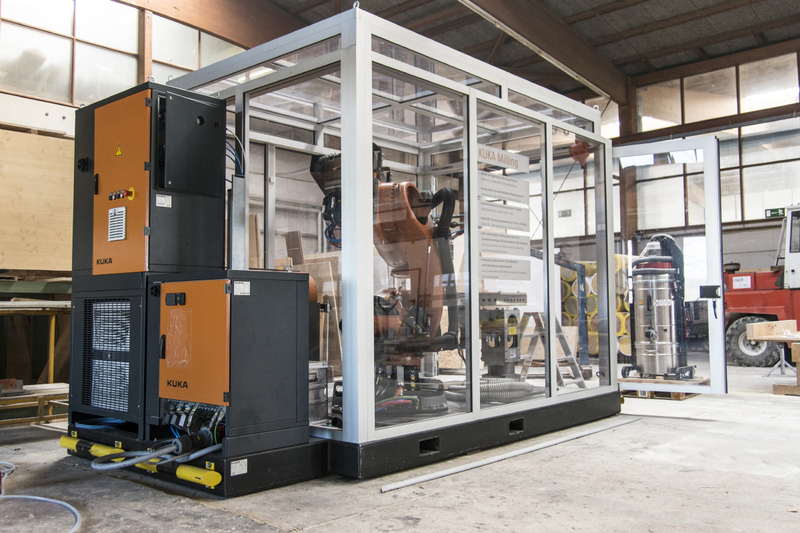 The industrial robot’s kinematic flexibility is an essential requirement for the production of such complex and individual geometries. 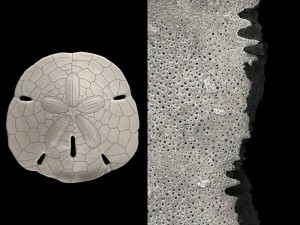 Consequently, the fact that, similar to the sand dollar’s plate skeleton, all plywood plates are geometrically unique, poses no additional difficulties. 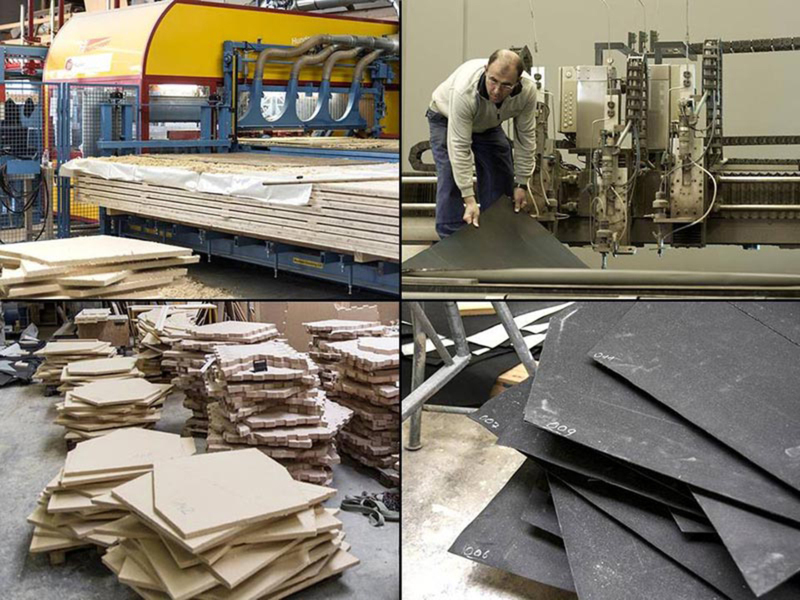 Pre-fabrication of the plate shell elements required only 3 weeks. 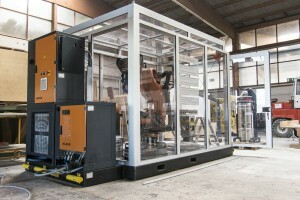 In comparison to conventional prefabrication methods, the developed fabrication technique allows for a much higher precision. 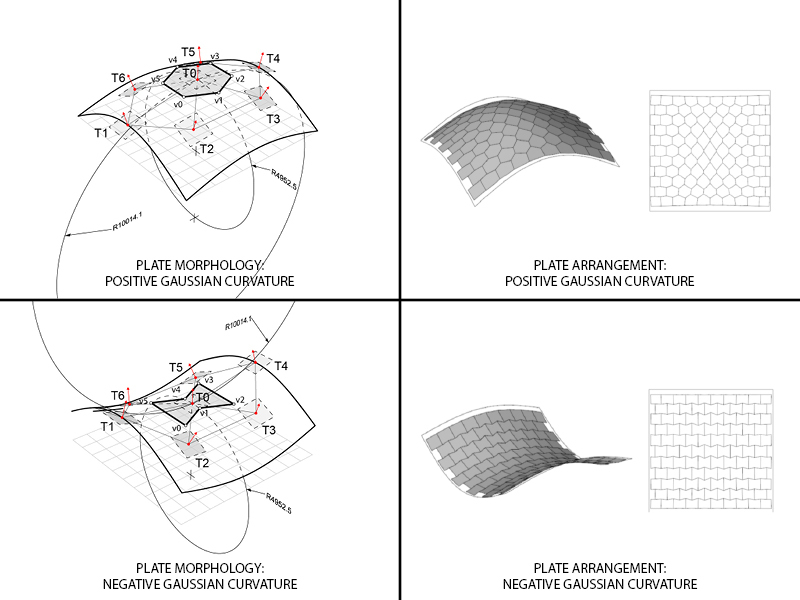 Quality assurance of all individually fabricated plates therefore poses a significant challenge and requires a laser tracker capable of scanning in a sub millimetre range. 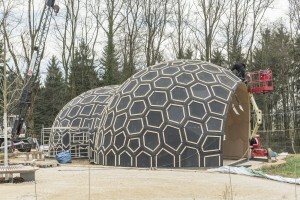 Additionally, the finished building will repeatedly be scanned three-dimensionally to analyse the structure’s long-term behaviour. At this point, it was already possible to conclude that the plywood plate’s in-plane mean square deviation, which is a measure for fabrication accuracy, is only 0.86mm. In comparison to tolerances in conventional timber construction, this is an exceptionally low value – especially considering that the plate structure is building shell and finished interior surface at the same time. 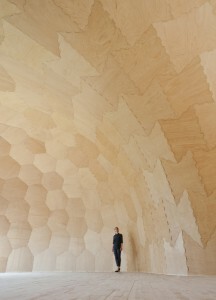 Ultimately, this accuracy is a necessary requirement for performative connection geometries in timber construction. The Landesgartenschau Exhibition Hall is the first building whose primary structure consists of robotically fabricated beech plywood plates. 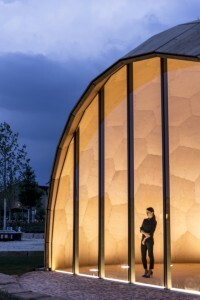 Similar to the functional integration in many biological systems, the plate system forms the building’s structure and envelope at the same time. The structural loads that occur around the plate’s edges are transferred efficiently by the robotically fabricated finger joints. 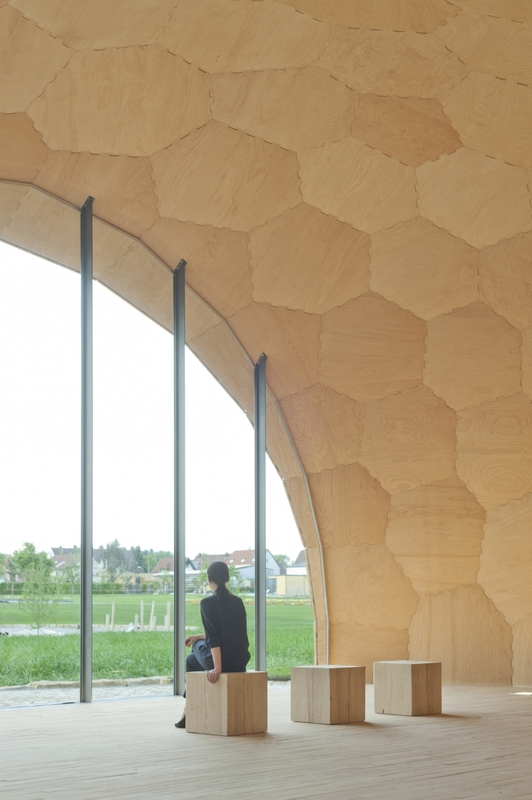 This new kind of timber construction allows the building to be made of only 50mm thick plywood plates. 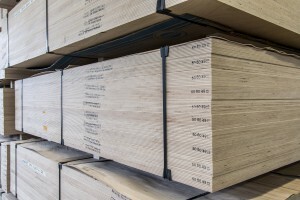 Using locally available beech is not only in accordance with future foresting strategies in central Europe, but is also especially suitable for lightweight timber constructions because of the material’s excellent mechanical characteristics. With a surface envelope of 245 m² and dimensions of about 17 x 11 x 6 m (56 x 36 x 20 ft) the building offers a floor space of 125 m² (1560 sq ft) and a gross volume of 605 m³. The very thin load bearing structure required only 12 m³ of beech plywood. 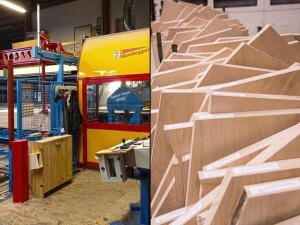 Additionally, almost all off-cut produced during fabrication was re-used as parquet flooring. After robotic fabrication of the primary structure and digital prefabrication of all other building layers such as insulation, waterproofing and cladding, the building was set up on site in only four weeks. 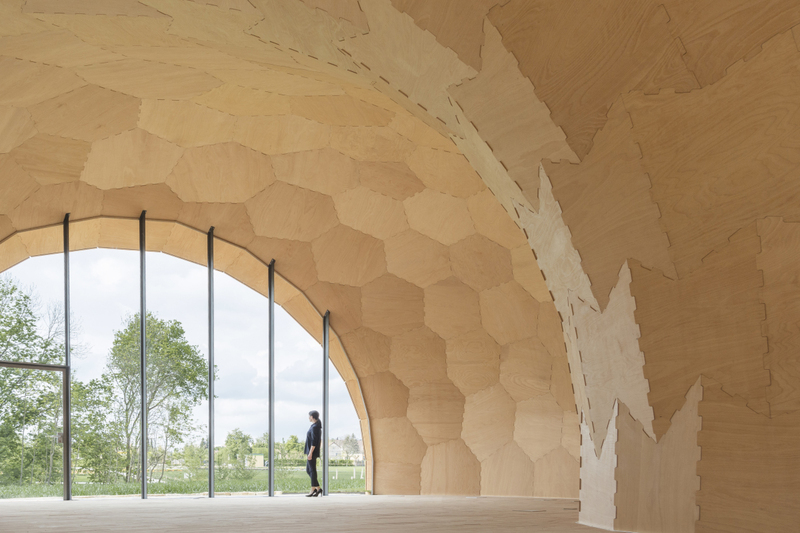 The Landesgartenschau Exhibition Hall is organized into two individual spatial zones that are differentiated through the building’s overall geometry: the entrance space and the main exhibition space. 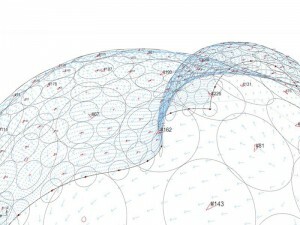 In both zones the plate structure is dome-shaped consisting of convex polygonal plates. 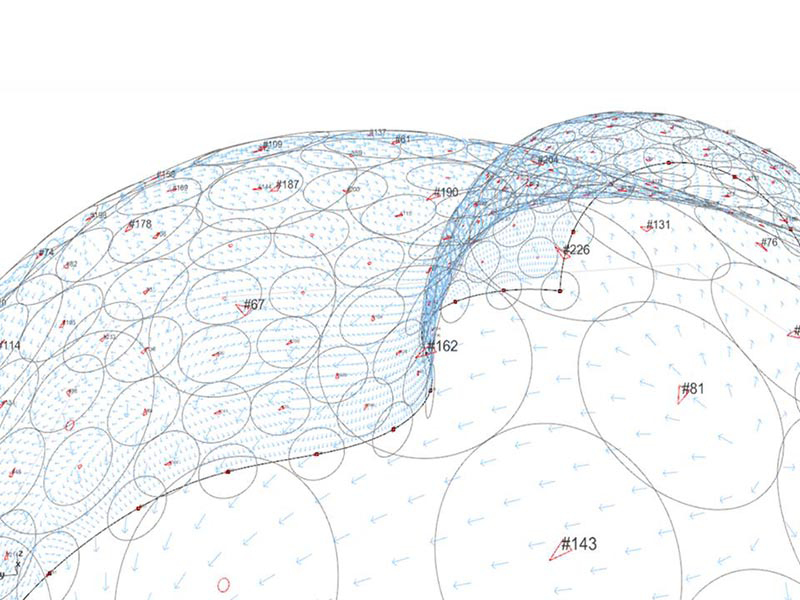 An intermediate space or transition zone is defined by a saddle-shaped spatial contraction where the shell consists of concave polygonal plates. Visitors enter the building through the lower part of the shell and are guided through the slight narrowing of the structure to the 6 meters high main space with its large glass facade opening towards the surrounding landscape. 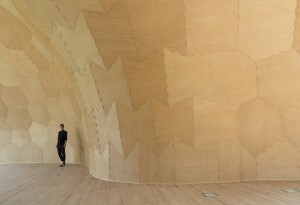 The interior is characterised not only by its global geometry, but particularly by the plywood plates and their visible finger joint connections. The geometric gradient between convex and concave polygonal plates emphasises the spatial arrangement. The construction principles that were derived from the geometric differentiation of biological systems remain visible and become part of the architectural experience. 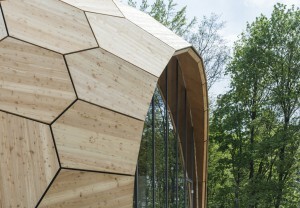 The development, fabrication and construction of the Landesgartenschau Exhibition Hall demonstrates that robotic fabrication in conjunction with computational design, simulation and surveying methods enable architects, structural engineers and timber manufacturers to work interdisciplinary as well as material- and fabrication-oriented. 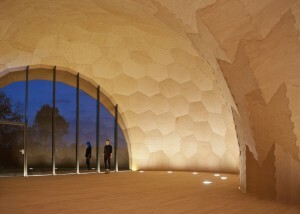 This leads not only to resource efficient timber constructions but also to a novel and expressive architecture.